The VIZIO D40u-D1 is a fairly inexpensive smart TV with a 4K, or 2160p, display resolution. It is nearly 40 inches wide and close to 25 inches tall. With wireless and Ethernet connections, it is easy to set up with your home internet connection. Apps available within the TV itself are most of the major entertainment subscription providers like Hulu, Netflix, YouTube and Vudu. It comes with a one-year warranty and is Energy Star certified with Energy Star version 7.0. It has three HDMI ports for connecting gaming devices, streaming devices or other kinds of movie players. There is USB connectivity for flash drive content, and you can use it to show off photos as well. This TV is in VIZIO ’s D series which is much less expensive than the M series they had previously released but very similar to the M series in a lot of ways. The VIZIO D40u-D1 boasts capabilities and features that are hard to find in a television of the same price elsewhere. However, not all features function properly. For example, part of the allure of this television for its price is the 4K-resolution capability. Unfortunately, the 4K settings do not consistently perform as they should for movies and games, so 1080p resolution is more consistent and realistic for this TV. A lot of gamers who purchased this TV did so to use it as a monitor for their PC gaming setup. Out of the box, the TV is set on its vivid setting which emphasizes cool colors, especially blue. It also has a gaming mode which reduces motion blur and gives a great input response time. The dark room and calibrated settings are warmer and focus on more realistic coloring. The standard setting is even more cool and blue-centered than vivid. The computer setting is good for gaming along with the gaming setting. It reduces motion blur and judder and eliminates sharpness settings. The reduced-judder option is really most useful for sports and gaming. Though it is called a “reduced judder” setting, it should have the ability to eliminate judder altogether, but this is not the case. Other than that, the excess efforts towards clarity and overly enhanced feeling can actually make the picture look outdated and cheap. The colors are vivid and very suitable for a gaming experience. It also successfully avoids black pixels looking too purple toned. Black pixels actually look black, even though the television has a glossy finish on the screen. However, there is not uniform brightness across the entire screen during viewing or gameplay. This is a common problem for LED screens. This should be reduced by the local dimming feature, but there are only eight LED zones so it really does not improve the contrast noticeably. While the colors are impressive in gameplay from a straight-on view, viewing from a side angle will decrease the color quality and saturation by close to 20 percent. It is not very suitable for a large group of people to watch something from multiple angles. This is similar to the views of photos. Just because you can view your photos on the television does not mean that they will look good. The screen has a frame rate of 240Hz. Although it has capabilities to connect to wireless internet, no internet browser is available with this TV. This is particularly problematic because it is connected to the Yahoo! app store which is quite limited. While it does come with many major streaming apps included automatically, it would be quite difficult to add additional apps if the desired app was even available. This ultra-HD smart TV comes with a unique remote that includes buttons specifically for top-rated apps. However, many users did not like the remote because the buttons are very small, and there was no backlight. This makes it extremely difficult to use in rooms with low lighting. It is also difficult for some adults to use with such small buttons, and the size of the remote itself makes it difficult to keep track of. Most people take the risk of purchasing this television because it is one of the least-expensive televisions with 4K display capabilities. 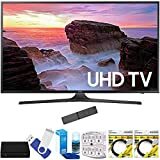 The price of this TV is great for a 4K monitor for gaming which is what many people purchase it for in the first place. That does not necessarily mean it is a high-quality 4K screen though. On the VIZIO website, this TV currently has a price just under $400. This seems like a low price to begin with, but it can easily be found for even less. On Amazon, certified and reputable sellers list the product for roughly $270. On eBay, you can save an additional $40 with a price tag of $230. It is close to impossible to beat this model of television on the price, but it is pretty easy for the VIZIO D40u-D1 to be defeated in performance. The TCL43S405 is roughly the same price, but it is probably a lot more worth it. It can be found on Amazon for $280, but the price jumps to $350 at Best Buy and $380 on eBay. However, this is still less than the original retail price of the VIZIO when it was released. This television has a 43-inch screen with 4K resolution. It has the same wireless internet capabilities, but even though the specs are the same the performance is better with the TCL according to reviews. It also has a one-year warranty and the same number of HDMI ports, which is three. With Dolby Digital Plus, the audio of the TCL is consistently better than the VIZIO. It also has an LED screen, but one of the most unique features is that the TV has Roku accessibility which the VIZIO does not. 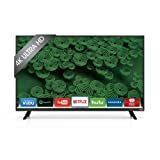 Even though the refresh rate of 120Hz is lower than that of the VIZIO, the TCL43S405 is the highest rated on Amazon out of the comparisons here. One thing that the VIZIO does have over the TCL, however, is that the TCL has no RCA inputs for sound which the VIZIO does include. Another comparable model is the Samsung UN40MU6300FXZA. This 4K ultra-HD smart TV is $400 at Best Buy, $350 on eBay and $385 on Amazon. The wireless capabilities are the same as the VIZIO but as with the TCL, the same specs do not necessarily mean the same performance. The VIZIO does have a better warranty than the Samsung which only gives you 90 days. It also has three HDMI ports and Dolby Digital Plus audio. This television’s unique features are voice control and mirroring availability along with a smart remote. The online ratings for the Samsung are not quite as good as the TCL, but they are consistently better than the VIZIO reviews. Out of more than 1,000 reviews, the overall rating is four stars for the Samsung. The downside of the Samsung is definitely the higher price as well as the requirement for Samsung advertisements within certain apps. The 90-day warranty could be seen as a significant downside but if the performance and longevity of the television is better than the VIZIO, it would be better to take a 90-day warranty for a better overall experience. When comparing each of these televisions side by side, it is clear that the TCL and Samsung have better quality in the similar models for reasonable price differences. The main pro for the VIZIO D40u-D1 is the price, but the cons are mostly with performance and quality which creates a lot of big problems. For the VIZIO D series 40-inch UHD television, customer reviews are extremely mixed. Many users experienced pixels on the screen going dead and remaining black at all times. Some consumers reported that the television performed well but only for about a year before completely shutting down and losing all functionality. These reviews are very problematic especially because of the warranty. With a one-year warranty and many users losing the performance of their televisions very close to one year after purchase, VIZIO appears to be careless at the very least and unethical at the worst. While a lot of users said their gaming experience was spectacular and there was no lag in games with this TV, a lot of users shared that their TV unit froze often and did not perform as expected with response speeds. Some disappointed users still think the TV is worth the problems they face because it is so inexpensive. It is definitely true that you have to take a risk on this product. Aside from the problem of only one year of functionality, multiple users ran into another problem with the warranty. If they were fortunate enough to have their television stop working at 11 months rather than past 12 months, they had a lot of difficulty coming to any resolution with the company. There were multiple complaints of the warranty not being honored to begin with. The price of it may be lower than many other models, but you are not necessarily guaranteed the most reliable performance. On Amazon, just over half of the total reviews for the TV were five star ratings and another almost 20 percent were four star ratings. However, the reviews there that are unfavorable are in large number as well. Almost 15 percent of Amazon reviews were one star, and two-star reviews make up the rest. Almost no one was neutral on their experience with the VIZIO D40u-D1. Now, it is entirely possible that those who gave positive reviews submitted their reviews before they approached the same problem around the one-year warranty that so many others experienced. While the picture, when it worked properly, was reported to be crisp and clear, the speakers left much to be desired. It took a mere three months for one reviewer to hear rattling in the speakers. Another claimed that the sound had sounded like it was filled with static from the very beginning. Multiple users experienced poor sound quality, the brightness changing periodically and the picture freezing up frequently. Perhaps the most interesting recurring review, or the most concerning, is that multiple users experienced their televisions turning off or on without being prompted. When this occurred, it was also not an isolated experience. Users would regularly have to turn the TV back on after it shut off unexpectedly, or they would have to turn the TV off because it would start up on its own. Those who were satisfied with it had very few complaints, but it appears that those who had one problem with the TV had more than one issue with it. It may be a great deal for a 4K TV but it is definitely a risk, because your desire for a 4K monitor on a budget could result in a monitor that does not function well on a 4K setting to begin with. Great Deal or Big Flop? It cannot be ignored that quite a few people are very pleased with their purchase of this TV. For them, it appears to be a great deal well worth the risk. However, the statistics are not very impressive. With a 50 percent satisfaction rate on Amazon, and even worse ratings elsewhere, you would essentially be paying possibly up to $400 with a risk equal to the outcome of a coin toss. Chances are if you are seriously looking to save hundreds of dollars on a quality 4K ultra-HD smart TV, you don’t want to risk $400 on a TV that will likely only last a year if other problems don’t arise first. A fair recommendation of this TV would definitely be to choose another option. For similar features and much better quality at a very similar price, the TCL43S405 would be a much better choice. The Samsung UN40MU6300FXZA is a little more of a splurge, but also more worth the money than the VIZIO. The Vizio D40u-D1 boasts capabilities and features that are hard to find in a television of the same price elsewhere. Although, the 4K settings do not consistently perform as they should for movies and games. So, 1080p resolution is more consistent and realistic for this TV. The colors are vivid and very suitable for a gaming experience. Overall, we are giving this 4 out of 5 stars.